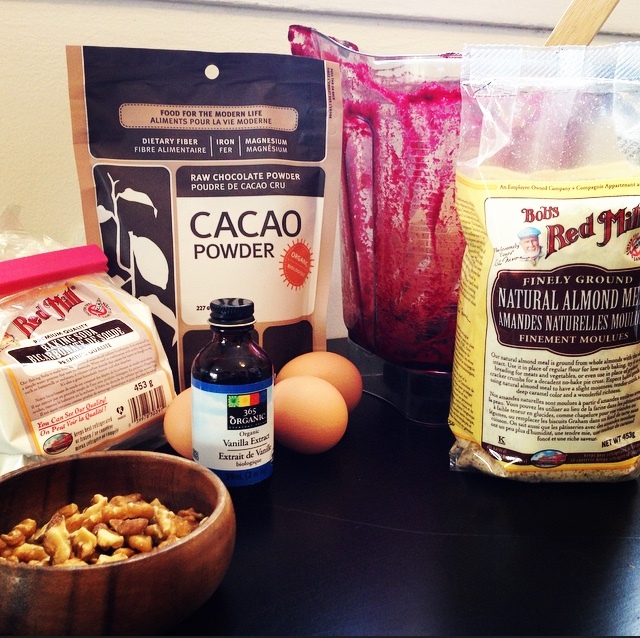 Pal/Valentine’s Day Beet Brownies – Gluten and Dairy Free! I saw a recipe for beet brownies on Move Nourish Believe so Erin and I decided to try baking… which is kind of a stretch for us. Trust me, we LOVE baked goods, but I personally don’t always enjoy following recipes and measurements closely. So here went nothing! Preheat oven to 350F, then boil the beets in salted water in a sauce pan for 15-20 minutes until tender. Drain and leave to cool. Peel the skin (may want to wear gloves because they stain… BAD). Chop into cubes and blend in a food processor (or vitamix). Squeeze the paste through a sieve and set aside 2 tbsp of beet juice for the icing. Place beet paste in a bowl. Put the eggs, sugar and vanilla extract in a mixing bowl, beat with an electric beater until fluffy. Fold egg mixture into the beet bowl. Fold in the cacao, baking powder and almond meal. Pour into a baking tin and bake for 25 minutes. The brownies should still be slightly gooey in the middle. Allow to cool. To make the icing, mix the melted coconut oil and beetroot juice together. Roughly drizzle onto the brownies. And we topped some of the other brownies with blueberries and hemp seeds.